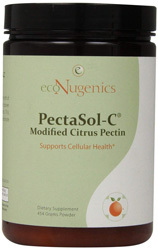 PectaSol-C® Modified Citrus Pectin (454 grams) by ecoNugenics® is Professionally Formulated to Help Maintain Healthy Galectin-3 Levels and Support Cellular & Immune System Health. Safe & Natural. Pectin is a soluble dietary fiber composed of galacturonic acid and varying amounts of galactose, glucose, rhammose, and arabinose. In its natural state, the galacturonic groups are found esterified. Regular pectin is not absorbed due to its large size, but it nevertheless plays a key dietary role in supporting digestive and cardiovascular health. It is also commonly used as a gelling agent in foods. PectaSol-C MCP is a special class of pectin that was developed by Isaac Eliaz, MD, LAc. Dr. Eliaz has researched and published articles on citrus pectin for over a decade. MCP is protected by US patents #6,274,566, #6,462,029, and #7,026,302. PectaSol-C® MCP is produced using a scientifically validated proprietary process that carefully controls both the molecular weight (MW) and degree of esterification (DE). The specific low molecular weight size range of PectaSol-C® MCP allows easy absorption into the bloodstream with the effective range of molecular size and esterification. Dr. Eliaz developed the PectalSol® brand as the first modified citrus pectin for human use. This MCP is designed to be a superior ligand for galectin-3 and involved extensive preproduction research. A cell culture model using aberrant prostate cells was used to help determine the optimal MW and DE by demonstrating cytotoxicity (cell death). After optimization, PectaSol® was immediately tested clinically. PectaSol® is the only brand of modified citrus pectin that has been validated in human clinical trials. PectaSol-C® MCP is an integral part of Dr. Eliaz' Healthy Cellular Support Protocols. The modification process has been improved to now produce more pectin molecules in the effective lower range of molecular weight. The drying process has also been improved to produce a finer particle size as well, with more than 90% below 100 microns. This means a better absorbed product. The new recent developments have been clinically demonstrated to benefit the quality of life of advanced state conditions. This product is called PectaSol-C® to differentiate the improved modification. A clinical trial demonstrated PectaSol®’s ability to bind and remove toxic heavy metals and while not affecting essential minerals. A recent study reported that PectaSol significantly decreased lead levels in children (ages 5 to 12) who suffered from severe lead poisoning. PectaSol-C® MCP contains polysaccharide components that researchers have shown shift T cell balance to favor Natural Killer (NK) cell activation. Other Ingredients: Vegetable capsule, stearic acid, magnesium stearate, silicon dioxide, microcrystalline cellulose. Suggested Use: As a dietary supplement for maximum support, take one 5 gram scoop 3 times daily with liquid on an empty stomach. For long term maintenance, take one 5 gram scoop per day with liquid on an empty stomach or as recommended by your healthcare practitioner.